for him. Which is right? of restricting water intake from a hot horse. the horse to consume at his leisure. intrinsically know not to merely stall a horse whose nostrils are still flaring from a hard ride. the skin, which can be a cause for dermatologic issues. Liked this article? 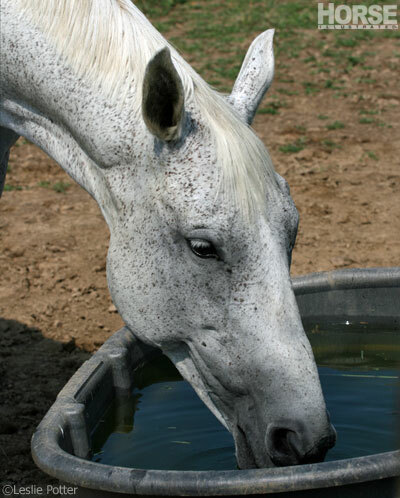 Here’s more on keeping your horse healthy in hot weather. sheep, pigs, llamas, and alpacas thrown in for good measure. Follow her on Twitter: @annaobriendvm. Glad to see these myths busted right on the front page! I’m sure many a hot, sweaty horse would thank you. Very interesting! I’ve always wondered that too. Thanks for printing these tips! Most of it I already knew, but I learned a few new things! I’m glad this was addressed, it never made sense to me to keep a hot thirsty horse from drinking, I know I’d be in torment in the horse’s place! The vet I worked for in the past always instructed us to cool down the legs and extremeties with cool water before hosing down the chest so you don’t shock the internal organs.